Product Detail Summary: Mega Bloks introduces the Call of Duty® Collector Construction Sets. The shambling undead march ceaselessly about the Zombies TranZit Farm. The buildable farm is a huge structure measures 17L x 8.5W x 9H in inches and is set as the focus for the four highly detailed zombies who are out to find their next victim. 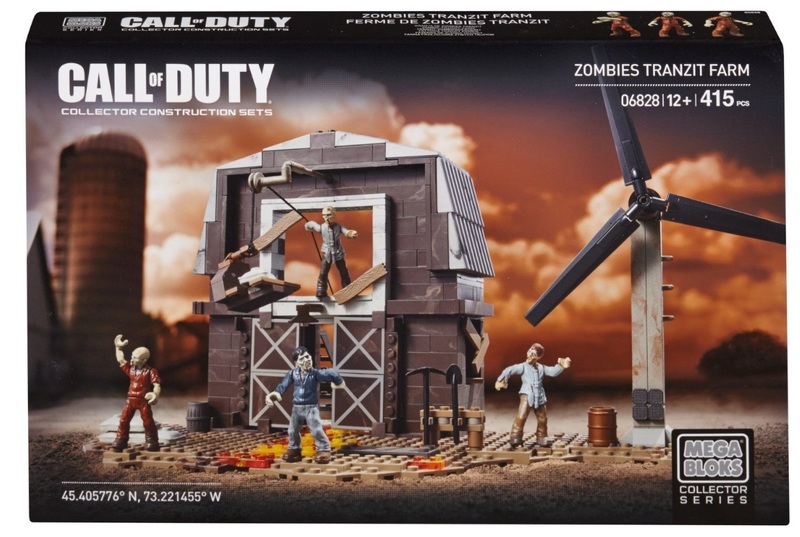 The TranZit Farm includes a spinning windmill, breakaway boards, opening and closing barn doors, even buildable lava. Included are farm-based accessories to use as makeshift weapons, and action-reaction areas to fool the zombies with like the bale drop. All four zombies are extremely detailed, and are perfect for anyone’s assault against the forces of the undead. • Over 10 highly detailed accessories and weapons that include shovel, pick, barrels, sandbags, wooden planks and more!